Leadership Behavior DNA (LBDNA) is one of the only assessments in the world that specifically assesses and interprets natural leadership behavior. Created in partnership with DNA Behavior International® our experience is anchored in more than 25 years of research and working with Ph.D.’s to develop world-class behavioral assessments that measure the natural talents that are unique to each person. These are the talents (strengths and struggles) that each person brings into the leadership role. Understanding them is the basis for the self-awareness needed to reach their full potential. When an individual takes the 10-minute questionnaire, multiple reports are instantly available for personal and team development. From the unique LBDNA report to custom reports for hiring, coaching, and teams, we’ve incorporated our behavioral and experiential knowledge to make the most effective tools available. Become a trained LBDNA Certified Advisor allows professionals to administer and interpret report results for their own organization or offer LBDNA as a service to your clients. It’s worth the ease and accessibility when using LBDNA on a regular basis for hiring, personal coaching, or team development. The DNA Behavior Assessment is comprised of 46 sets of three non-situational items (pairs of phrases) that relate to one of the 8 factors using a forced choice rating (most like, least like) methodology. We spent the time and resources to develop one of the most accurate assessments to validate natural behavior. 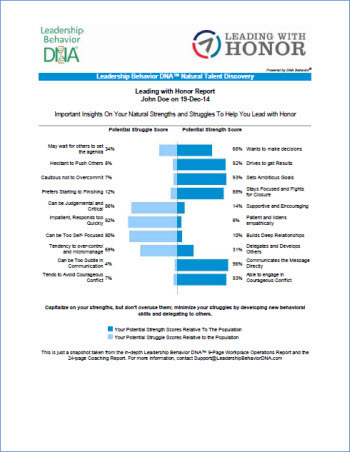 Please explore more about Leadership Behavior DNA using the right sidebar menu.